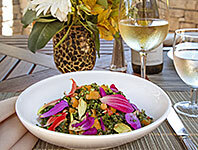 Quail Lodge & Golf Club ****, Carmel Valley, CA - GourmetVoyageurs.com - Upscale Food and Travel eMagazine - Reviews and Stories. Located in the heart of the Carmel Valley, California, on the sunny side of Carmel-by-the-Sea on the spectacular Monterey Peninsula, the Lodge is approximately 120 miles south of San Francisco and 330 miles north of Los Angeles. It reopened in April 2013 following an extensive renovation of its guest accommodations and public spaces. As well as the world class golf course, it is a lovely inn and hotel that includes 77 guest rooms and 14 suites. The decor is a combination of clean, modern, frills free clarity and "Craftsman" furniture. It sports hardwood floors and most rooms and all the suites have their own a balcony or patio. A great new chef, Ken MacDonald, has joined the kitchen and is producing superbly garden fresh cuisine at "Edgar's" restaurant. Quail Lodge & Golf Club **** Resort is blessed with beautiful grounds, handsome rooms and suites that range from large apartment sized suites to more intimate guest rooms. The rooms and suites are set in numerous free standing buildings around the campus joined by tree shaded walk ways and decorated with lovely plantings and borders. The buildings form a sort of flock surrounding the main lodge with its new deck terrace that itself looks out over a large Mallard duck pond with a beautiful and soothing fountain. (video)The pond squeezes up and under a foot bridge and expands out the other side right up to one of the fairways of the golf course. The magnificent Robert Muir Graves 18 hole championship golf course is a pleasure on all counts. The lodge is nestled on 850 acres of its lush fairways, oak-studded meadows and sparkling ponds that are home to families of Mallard ducks who pick and choose which of the many ponds they will enjoy. 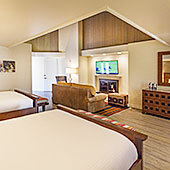 Quail Lodge has attracted visitors to Carmel Valley for generations since it first opened in 1964. Since then, it has had a number of make-over with this its most recent. The ninety three rooms and suites (video) are with garden or lake views, boast as well, private decks or patios. Our spacious suite, painted largely white but with a soft buttery yellow on one wall, under the large screen TV, was a remote controlled fire place which was a great pleasure on the cool evenings and crisp, chilly mornings of the Central Coast. The living room area opened onto a private patio with teak furniture and a view out over the duck pond to the lodge. Complimentary wifi and Keurig coffee makers are provided in all accommodations in addition to all of the other amenities. Bathrooms are spacious, attractive with large separate showers as well as the tub. We really love the pet friendly atmosphere and so enjoy watching our four legged pals play along the many tree shaded walking paths complete with "doggie plastic bag" stations and wood encased disposal receptacles for their owners' convenience. There is even a pet "concierge" service available along with spacious doggie beds and treats for our lovable "best friends". The pool (video)is a great place to kick back, and just up a short flight of steps are three separate fitness rooms: one for cardio, one for weights and another for stretching. There are tennis courts and a Pétanque (also known as "boules") pitch set up with two lanes. The current form of the game originated in 1907 in La Ciotat, in Provence, in southern France. Similar games are bocce and bowls using the same basic set of balls and the small wooden ball to get as close to as possible called a "cochonnet". The game is won by whoever ends up closest. We are told that the main dining room at the lodge, which is unused at the moment, may one day become a restaurant but that is in the future. Meanwhile, "Edgar's" informal dining is a treat (more below). The Lodge offers a family game center and a movie/presentation room, while outdoor activities include, in addition to the already mentioned golf, extensive nature trails, hiking in the adjacent Garland Ranch Regional Park and the only Land Rover Experience Driving School on the West Coast. Additional recreational activities nearby include whale watching, deep-sea fishing, kayaking, hiking, horseback riding and scuba diving in Monterey Bay. The Lodge's restaurant is "Edgar's" (video) located in the golf club house about a quarter mile from the Lodge itself. Chef Ken MacDonald was brought in to breath new life into "Edgar's" which he has done with alacrity. MacDonald (yes he is Scottish, accent and all) brings a wealth of experience from around the world to his task. Steeped in the conviction that only the freshest and best ingredients can possibly result in great taste, he insists on only the best and freshest ingredients and his dishes pay tribute to this tradition. His task is to create a cuisine to attract visitors from outside the club as well as to make the existing members and regulars happy. So his menu is a combination of old favorites rendered with skill and a new twist as well as new items entirely from the creative mind of chef MacDonald. He goes himself to the Farmer's Market at the "Cross Roads" shopping center at the mouth of the valley (see video). He also quickly connected with the best suppliers in the area for his other needs from tomatoes still warm from the sun on arrival to lettuce still with the morning dew on them and intact roots with soil still clinging to them. His cooking reflects the global influences he picked up with stints at the Ritz Hotel in London, the "City Tattersalls Club" in Sydney, Australia, "Pan Pacific Sonargaon Hotel" in Dhaka, Bangladesh, several hotels throughout both South Africa and India and he has cooked for royalty, celebrities and heads of state. This talented Scottish import was most recently executive chef in Leavenworth, WA at the "Sleeping Lady Mountain Resort" before land at "Edgar's". Chef MacDonald has made "Edgar's" a serious dining destination despite the informality of the "club" surroundings. Eating seasonally is of major importance to chef MacDonald and his creative and harmonious blending of ingredients is evident in all of his preparations and dishes. 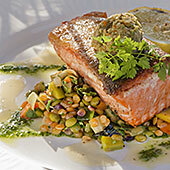 Monterey County boasts some wonderful products and chef is a big proponent of supporting local growers and suppliers. Lunch (see our video "Join us for Lunch and Dinner at Edgar's") time brought us some original and delicious plates. An organic Kale Salad with roasted pumpkin seeds, chives and roasted peppers with citrus dressing was original and lovely. This was followed by a flat bread pizza with artichokes, tomato, goat cheese, basil pesto and mozzarella with a touch of truffle oil which we shared but left us wanting more. Delicate Sand Dabs simply sauteed with fresh baby vegetables was wonderful. After a brisk, long walk back to the lodge, a change of clothes and a time on our patio being soothed by the sound of the large fountain in the center of the Mallard duck pond around which are arranged the various buildings containing the rooms and their shady patios, we were ready for dinner. We enjoyed our first course on the patio, protected from the breezes off the sea by glass panels. Peter opted for the local organic seasonal tomatoes with local live oil, shaved tome of cheese, balsamic and wild arugula - a refreshing and happy choice. I loved the house cured salmon and well dressed Caesar salad with aged, shaved parmesan. As it started to get a touch chilly, we adjourned into the mellow dining room. Peter had an excellent locally line caught King Salmon, organic red lentil hash and seasonal vegetables that was perfect. It came with a dollop of some strong sauce which was applied in such a way that if you preferred the fish without it, it was easy to move over to the side. As I am addicted to all forms of chicken, I enjoyed the "Amish" chicken disk. It was roasted, free range chicken served with smoky eggplant and crushed sweet potato with organic yogurt and did not disappoint. All I could handle after all of these generous and delectable tastes was a champagne strawberry sorbet. But Peter who never seems to know when he has had enough treated himself to the Summer Berry Trifle. He somehow managed to find space for it although he could not help commenting that a splash of sherry or rum would not have gone astray. The 18-hole golf course at Quail Lodge offers relaxed California golf at its very best. Designed by Robert Muir Graves, the tree-lined, par-71 course features a practice facility and three sets of tees at each hole. It features 6,515 yards of golf from the longest tees for a par of 71 and occupies 850 lush acres for its fairways. KemperSports, which operates golf, resort and sports facilities in 26 states and internationally,including Bandon Dunes Golf Resort and Chambers Bay, host of the 2015 U.S. Open, manages all golf operations for the hotel and club. There is world-class and award-winning golf instruction at Quail Lodge Golf Academy, or you can enroll in a variety of Golf Lessons. Gather vital swing information and statistics for a custom club fitting using the TaylorMade 3D MAT-T Lab. Or allow the professional staff to put together a memorable Golf Tournament for groups of 16 players or more. 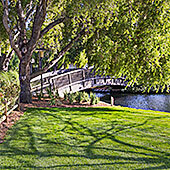 Quail Lodge and Golf Resort offers a relaxed, friendly and delightful stay for vacations and week-ends as well as for its superb golf course but also for the wineries and attractions of the famous Monterey-Carmel Peninsula and the Carmel Valley itself as well whose many wineries are just a few minutes from the lodge. For more on things to do in the Carmel Valley and the area click here.